Ford: some vehicles transmission will experience, after a cold soak or an extended period with engine off, a 2-3 shift hesitation due to possible hydraulic circuit drain. model 2013-16 various vehicles. Ford: certain darker colored vehicles will have visible markings of mold on front fascia and where fascia edge meets hood, 5 cm (2 inches) from headlamp fascia point on both sides. 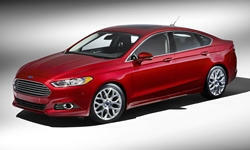 model 2013-16 fusion.